Are your cooling coils impacted and clogged with dirt and debris? 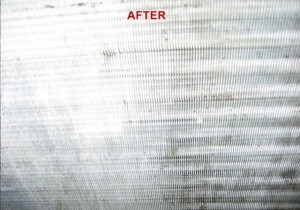 Proper commercial coil cleaning is your solution. If you are an engineer for a commercial building, you already clean your cooling coils on a regular basis. But even when you routinely clean your cooling coils, sometimes the dirt and debris builds up faster than you can clean it out and becomes heavier over time. With our heavy duty equipment specifically designed for cleaning cooling coils, we can help you make the most of your regular maintenance by deep cleaning your cooling coils. Preventive Maintenance (PM) of HVAC: Preventive maintenance will improve IAQ and reduce energy use by removing contaminant sources (e.g. clean coils/drain pans), and insuring proper calibration and efficient operation of mechanical components (e.g. fans, motors, thermostats and controls). Data from many buildings throughout the United States show that a properly commissioned building with controls and equipment functioning properly can save 5%-15% in total building energy cost. EPA, from the article "Indoor Air Quality and Energy Efficiency"
Over time, the dirt has built up on these coils, even with regular in-house cleaning. 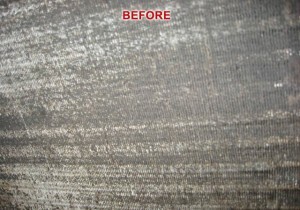 The lightened lines of an in-house pressure washer cleaning can be clearly seen. After cleaning with our powerful equipment, these cooling coils have been restored to a “like new” state. Since the air handler will be able to push air across the coils without as much effort, these coils are now much more energy efficient. Additionally, they will be easier to clean in-house for future cleanings. Could commercial coil cleaning solve your indoor air quality problems? Are your Delta-P’s too high? Has your BASIC pressure washing FAILED? Is your air flow restricted? Are you facing replacing your coils? Now you don’t have to replace the coils, which is costly both in time and money. 1) The system has to work twice as hard to get air through. All that dirt and debris means that your system is working overtime to push the air to the other side of the coils. 2) Possible odor issues and potentially hazardous microbes and fungal growth might be entering the air in your home. 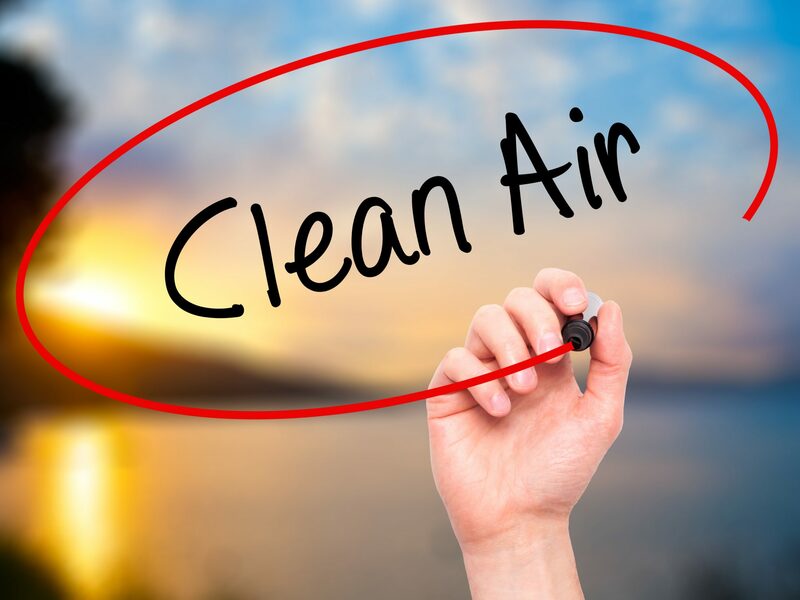 If you can smell a “musty” or “mildewy” odor whenever you turn on your air conditioning, it’s possible that you need to have your coils cleaned. 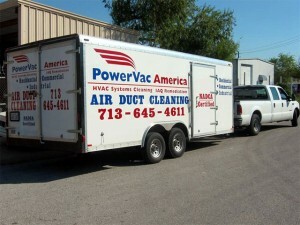 Call Power Vac America to speak with Mike and to get an estimate for cleaning your system! Although filters are used, the heating and cooling system still gets dirty through normal use. Contaminants in the heating and cooling system cause it to work harder and shorten the life of your system. When an HVAC system is clean, including the cooling coils, your system doesn’t have to work as hard to maintain the temperature you desire. As a result, less energy is used, leading to improved cost-effectiveness. 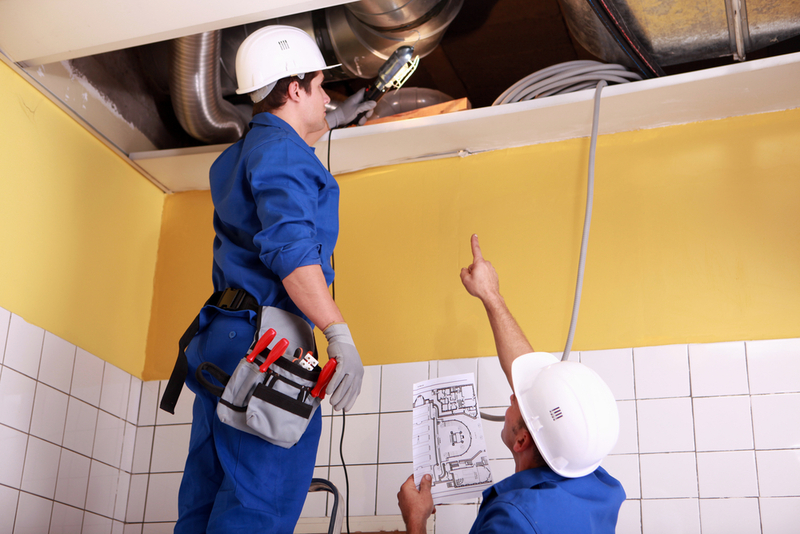 Indoor air quality is one concern that building managers and building tenants have when they decide to investigate an HVAC system. Through normal occupation in a building, we generate a great deal of contaminants and air pollutants, such as dander, dust, and chemicals. 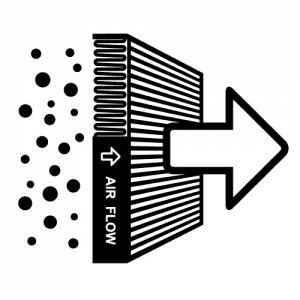 These contaminants are pulled into the HVAC system and re-circulated 5 to 7 times per day, on average. Over time, this re-circulation causes a build-up of contaminants in the ductwork. 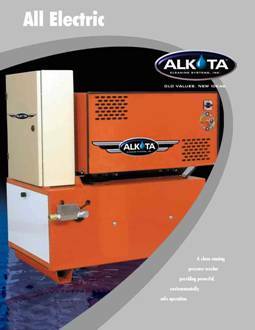 For especially dirty coils, we have an electric steam cleaner. Since it runs on electricity, it doesn’t require the ventilation of a traditional propane-based steam cleaner and can access cooling coils even in the tallest, most inaccessible buildings. Can be used with either our Clean & Green coil cleaner, or traditional coil cleaning products. We record before and after Delta P’s across the coils, to thoroughly document the increase in air flow resulting from the steam cleaning.